The original Cyrus jewel, depicted at left, compared to the reproduction jewel, at right. Since its inception, Ubar Grotto has worked to recreate the Grotto of yesterday combined with the flair of today. Earlier this year, another part of that mission was envisioned when Pro. Seth Anthony happened upon an old Past Monarch’s jewel with the thoughts of having it recreated for use by Grottoes today. Purchased at auction, and rendered in 10k gold, the piece was marvelous to behold and begged to be given a second chance at life. The jewel belonged to Pro. Ben Peterson of Cyrus Grotto in Hutchinson, Kansas. Pro. Ben was a farmer by trade and an active member of Cyrus Grotto’s Patrol Unit from the very early days of the Grotto. He later served as Monarch, earning the distinction of being a Past Monarch. Cyrus Grotto was chartered in 1922, meaning Ben would have served as the 7th Monarch of Cyrus in 1928. The Grotto closed in 1966, surrendering its charter to the Supreme Council. After receiving the jewel, Pro. Anthony contacted the fine folks at Wilkins Brothers, a well known jeweler that supplies regalia to several Masonic bodies. Dozens of pictures of the jewel were sent to the firm, along with specific measurements. After more than 3 months of work, the first prototype model was created. The prototype remains very close to the original jewel, only containing some minor cosmetic changes. At this time, Ubar, Azim, and Abaca Grottoes have all signed on to purchase jewels from the initial striking (set right now at 65 pieces.) 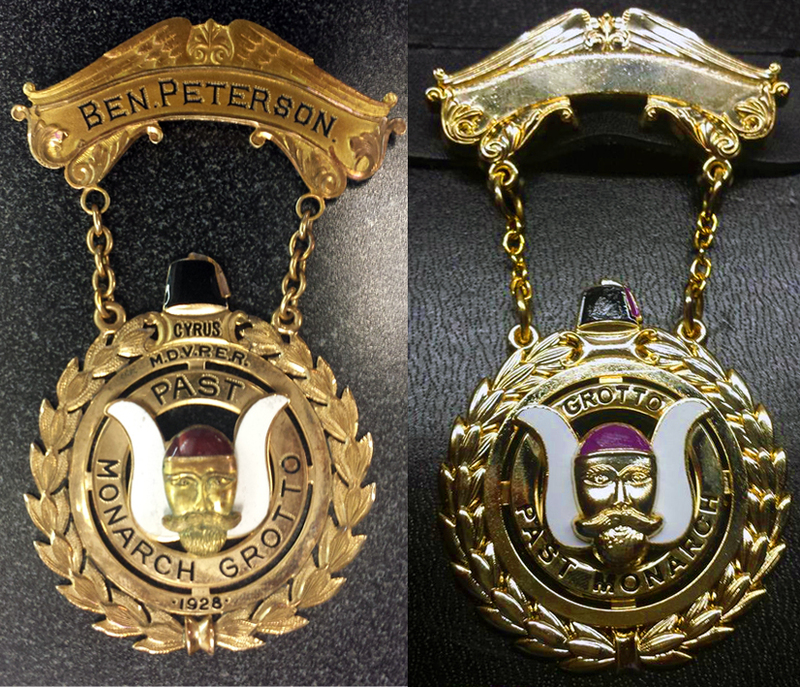 Each piece will come with a leather pocket holder and be provided in a padded jewel case imprinted with the words “Past Monarch.” The best part is that the jeweler was able to keep costs down, meaning each jewel should cost less than $25 a piece! This is a marvelous part of Grotto history, now made available for a new generation. We think Pro. Peterson would be justly proud to know that his jewel has inspired a whole new group of Prophets to strive for sympathy and good fellowship!